You'll be £5.20 closer to your next £10.00 credit when you purchase Digging in the Dark. What's this? The resurrection men of Yorkshire came from all walks of life, and employed a myriad of macabre methods to raise their defenceless prey from beneath the consecrated ground. This was a trade which offered great reward, but was definitely not for the faint of heart. Throughout this journey into the dark past of Yorkshire, we meet an infamous celebrity who made an unexpected reappearance, a travelling minstrel who was to become the talk of many towns, a child whose death was just the beginning of a tragic tale, and a holy man who helped a community but earned his own illicit rewards in return. Spanning over almost three centuries, this grim compendium of tales casts a shadow over the beauty of Yorkshire, a dark veil which reaches out in all directions, threatening the peace of the dearly departed across the length and breadth of the nation's largest county. This book is a quick read, each chapter describing a couple of incidents, some even humourous, and is sufficiently comprehensive to give the general reader a good understanding of the dubious trade and the devastating effect on relatives of the recently deceased. Well illustrated, this volume is recommended particularly to readers in Yorkshire who like to delve in to some of the murkier activities of the past. A fascinating set of historical facts about grave robbers and body snatchers in the Victorian era. Some stories are incredible, exceptionally well written and researched. This book discusses some really terrifying aspects of history, but all are presented to the reader - sometimes thanks to the sense of humour - so engaging. The book not only tells the stories of resurrection activities but places them in the wider historical context, in a constantly evolving society due to the industrial revolution, the complicity of the medical profession, also taking into account the legal and legislative side. A really nice and interesting reading. This well-written and gripping book focuses on the Resurrectionist trade as practiced in Yorkshire. Excellently researched and presented, Digging in the Dark gives a historical perspective to the actions of those involved, as well as including many tales of bodies stolen and the consequences. In a world where people believed their bodies needed to be whole for Judgment Day when the dead would rise, body-snatching was a very serious business indeed. Johnson has a Dickensian talent for telling a tale and this book would form the basis for a fine documentary. In writing about this subject, there is a temptation to veer either towards the blackly comic or the gruesomely gothic; Ben Johnson wisely avoids both. He is at pains to name the victims of the resurrectionists and show the suffering the practice wrought on the families of the deceased. His material is carefully researched and presented within its social and historical context, both in terms of wider developments in law and medicine and in terms of the specific area where the crimes occurred. There is good use of original sources to demonstrate how people at the time reacted to events, and the book is written in a fluid, accessible style. This is a fascinating read. A good story about the history of resurrectionism and the local Yorkshire history of the unsavory activity. Grave robbers have proved a fascinating if macabre interest for historians and writers alike. 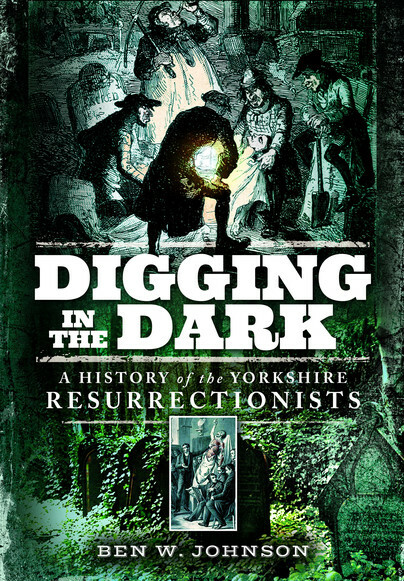 In this new book Digging in the Dark, author Ben Johnson turns his attention to our own Yorkshire Resurrectionists who came from all walks of life, and employed a myriad of macabre methods to raise their defenceless victims from beneath the consecrated ground. Through this book we hear of an infamous celebrity who made an unexpected reappearance, a travelling minstrel who was to become the talk of many towns, a holy man who helped a community but earned his own illicit rewards in return. Tales of streets in violent protest, a medical school reduced to ashes, and a gang of professionals moonlighting in the darkest occupation. In short a grim compendium of tales. The book is written in the breezy style of a journalist no doubt directed at the Yorkshire reader but if you have an interest in resurrectionists or the very dark side of humanity it will be of interest no matter where you live. A really interesting read which points a spotlight on the underworld of our past society. I would recommend this to those who have both an interest in history and the macabre. I think this is a great book for anybody interested in off beat history in Yorkshire, or anywhere in the UK really! Lots of tales and history on the 'sack em up men'. You may have heard of Burke and Hare - but the issue of grave robbing for medical research was widespread throughout the land. (Liverpool had it's own instances too!) A great crime related book. Digging in the Dark is a short read, and an interesting one. Burke and Hare might be the most (in)famous resurrectionists, but they weren’t the only ones. If you’re into this type of thing, give it a read. This is a fascinating compendium containing many rich tales of grave robbers and their victims (including children) that comes with first-hand accountings by newspapers and journals dated from the time of the robbing. If you enjoy a good macabre story and like it even better if it’s true, then this novel is for you! This book was very different but well worth your time reading it. Johnson provides background before moving into full, detailed history of various resurrection men. This overview also includes those who met have cheated death, including a piper who could not be hung but who was buried anyway. That’s all I am going to say about that, and if you want to know about that story (and you should), read the book. Johnson’s discussion includes the most famous Resurrection Burke and Hare, but the majority of the book is centred on Yorkshire and less known cases, including ones involving children’s bodies. The trials are discussed in details, including actual reporting and transcripts from the time. While at times, this can be a bit slow considering the style of whichever source he cites. Yet, what comes across quite clearly, is the fascination and interest that Johnson has for his subject matter. His interest in the subject more than compensates for various slow points in quoted material (and he gets credit for quoting the sources). I do hope that Johnson delivers a talk about this subject in the US because I sense that he would be fun to listen too.